A tomato bredie is the ultimate manifestation of South African home cooking. Ostensibly a stew, bredies form an integral part of South African huiskos (home cooking), and whilst there are a number of different types of bredies, tomato bredie seems to be the most cherished of them all. At a glance, a bredie looks like a very basic stew, but there is a key element that differentiates it from being a regular stew. Instead of simmering in a liquid like a conventional stew, a bredie is self-saucing. 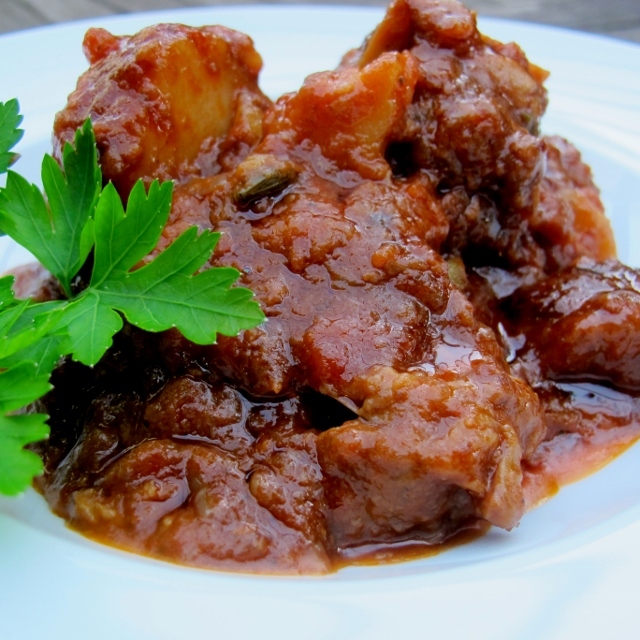 Absolutely no water is added to a bredie and the sauce is formed from the rendered juices and fat from the lamb, which when combined with the reduced tomato, results in an intensely flavoured gravy which transcends its humble basic ingredients. There are quite a few tomato bredie recipes out there but I’ve always stuck with Cass Abrahams‘s recipe, albeit with some unorthodox additions of my own. Cass Abrahams is widely regarded as the incumbent mother of Cape Malay cooking and her recipes are often the starting point for many of my own. When I initially attempted to make a tomato bredie I found the results were a bit watery and that the meat would sometimes be a little tough. I got around this by first dredging the meat in flour before browning it thoroughly and then by cooking the entire thing in the oven and not on the stove as it is usually done. Bredie traditionalists would be mortified by my preferred cooking method, but I find that cooking it in the oven helps the tomatoes break-down and creates an intensity in the gravy that you wouldn’t otherwise get when cooking it in the conventional way. I have been making my tomato bredie in this way for a number of years and they have always been a success, the meat is invariably melt-in-your-mouth tender and the sauce is thick and bursting with flavour. Season your lamb cubes with salt and pepper and then lightly dust with flour. Add the meat to the heated casserole and brown very well. Brown the meat in batches to avoid overcrowding the casserole. Set the browned meat to one side. Add the sliced onion, ground black peppercorns and the ground cloves. Immediately add the 125ml of water and allow the water to boil. After a couple of minutes the water will have evaporated. Add the remaining 2 tbsp. of oil and the cinnamon stick, sauté until the onions are soft and golden. Return the meat to the casserole along with the ginger and cardamom pods. Stir to combine, cover with a tight lid and then place in the hot oven for 25 minutes. After 25 minutes, take the casserole out of the oven. A thick gravy will have formed, give it a good stir. Add the prepared diced tomatoes, the tomato paste and the chilli. Close the lid and return to the oven for another 20 minutes. After 20 minutes, take the casserole out of the oven and add the potatoes, salt, extra freshly ground black pepper and the sugar. Stir t0 combine. Cover and return to the oven. Cook for about 40 minutes, stirring the bredie halfway through that time. You will know when it is cooked when the potatoes are soft and when the diced tomatoes have completely melted into the sauce and the oils have started to separate. The bredie should look glossy and smooth. I love your food..this was yummy! So glad you enjoyed it! I also make a pretty good Green Bean Bredie – promise to post it some day soon.